Comprehensive evaluation functions and many enhancement options make the Solar-Log 2000 a must for use in demanding situations. 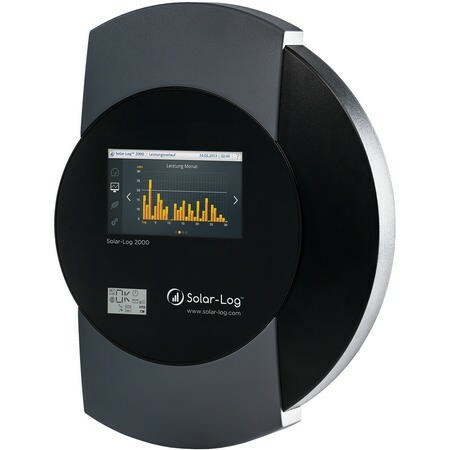 The Solar-Log 2000 is comfortable monitoring and controlling large-scale PV plants and solar power stations. The new high-performance top-of-the-line model can monitor a maximum plant size of 2000 kWp and up to 100 inverters. With its master/slave technology, a total of 10 Solar-Log 2000 can be connected together at one plant. This greatly expands the maximum possible plant size. Self-consumption The Solar-Log 2000 offers the option to measure the amount of self-produced power consumed and to present it graphically via the Solar-Log™ WEB “Commercial Edition”. An additional power meter serves as a consumption meter. Solar-Log 2000 alarm function This provides your plant with anti-theft protection and an external alarm against burglars and vandals. TFT-Touch-Display and access to Solar-Log™ The Solar-Log™ can be operated from a computer with a web browser or directly via the device’s TFT-Touch-Display. The graphical reports of yield data are visualized on the color TFT-Touch-Display and via the web browser. Remote access is possible with the Solar-Log™ WEB “Commercial Edition”. Inverters A maximum of 100 inverters (just one manufacturer per bus), maximum plant size 2000 kWp. Interfaces The interfaces can be used to connect inverters (up to two different manufacturers) and accessories such as Utility Meter, Pyranometer and SCBs. The Solar-Log 2000 Standard and Solar-Log 2000 PM+ have two RS485/RS422 interfaces and one RS485 interface. The Solar-Log 2000 GPRS and Solar-Log 2000 PM+/GPRS have one RS485/RS422 and one RS485 interface.